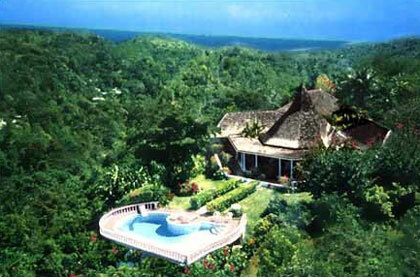 Serenity Villa is a breathtaking, elegant villa surrounded by the Jamaican country side. This absolutely magnificent home, located just minutes away from Ocho Rios, is no less than a paradise... perfect for vacations, romantic getaways, and even weddings. Once you step into the spacious 30-foot octagonal great room with Italian marble floors and a 50-foot pagoda ceiling, you will begin to feel the peace and serenity of the island wash over you! Enjoy the view of the surrounding country side while Reggae music plays from the stereo system and the live-in staff serves you drinks from the wet bar. Relax in one of the three bedrooms that open out to a 180-degree wrap-around veranda, or take a dip in the fresh-water pool with an overwhelming view of spectacular Oracabessa Bay. The pool is also beautifully lit for night swimming and is a refreshing way to end the day.